Welcome to the Nursing Student (Entry-Level Nurse) resume sample and writing tips page. 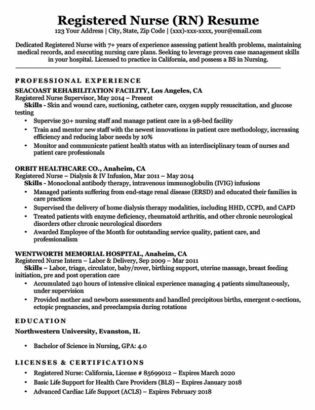 Here, you can learn how to write an excellent entry-level resume that will launch your nursing career. Or, if you’re strapped for time, try out our easy-to-use resumer generator and create one in minutes. Not the resume you’re looking for? View our database of professionally written resume examples. Not a big fan of this template? 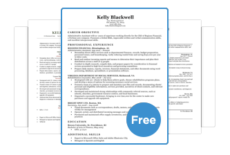 View our collection of HR-approved, handcrafted resume templates. Need some extra help? Take a look at our expansive library of cover letters for some tips to make yours stand out from the rest. 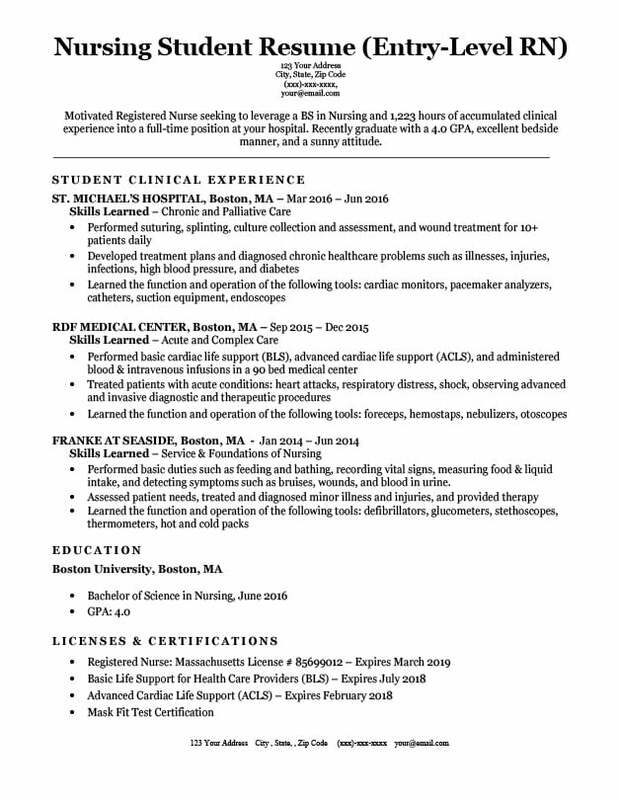 Motivated Registered Nurse seeking to leverage a BS in Nursing and 1,223 hours of accumulated clinical experience into a full time position at your hospital. Recently graduate with a 4.0 GPA, excellent bedside manner, and a sunny attitude. Performed basic duties such as feeding and bathing, recording vital signs, measuring food & liquid intake, and detecting symptoms such as bruises, wounds, and blood in urine. The job outlook for registered nurses is growing at 16%, and the median pay is nearly $70,000/yr. Congratulations on your decision to become a nurse. You’ve chosen to become a critical component of the healthcare system, someone people rely upon to take care them and their loved ones, and that is worthy choice. It’s also a smart financial choice — the job outlook for registered nurses is growing at 16%, and the median pay is nearly $70,000/yr. First, I’m going to quote the sample resume’s entire Career Objective, and label the parts that make it strong. 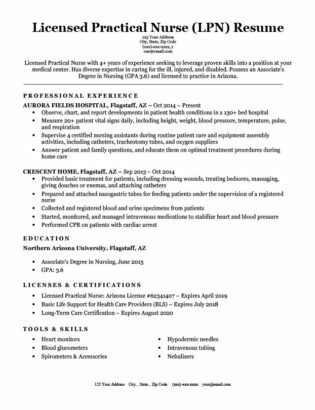 Motivated Registered Nurse1 seeking to leverage a BS in Nursing and 1,223 hours of accumulated clinical experience2 into a full time position at your hospital. Recently graduate with a 4.0 GPA, excellent bedside manner, and a sunny attitude3. Point #1: Let the hiring manager know right away that you’re a registered (or licensed) nurse. Describe yourself with an attribute — are you: Motivated? Efficient? Organized? Point #2: As a nursing student, part of your curriculum requires that you accumulate clinical experience. It’s smart to include the number of hours in your career objective — it lets the hiring manager know right away that you’ve gained plenty of experience, and are worth interviewing. Point #3: While it’s not a requirement for nurses to be sunny and have good bedside manners, it certainly doesn’t hurt. If you’re not the sunny type, think of some other attributes that an employer would like, such as multi-tasking ability, efficiency, depth of knowledge, or variety of skills. Next up, writing your Student Clinical Experience section, which is sort of like Professional Experience on a traditional resume. We’ve formatted this resume to include experience, tools, and skills all in the same section. While it’s a bit unusual, that’s ok — as long as your resume is clear and provides all of the necessary information, you can format your resume any way that you would like. The following image makes it clear how each work experience is formatted — 1) skills learned, 2) experiences bullet points, and 3) tools used. The reason this format works is because it clarifies for the hiring manager exactly what the candidate has learned from his or her clinical experience. 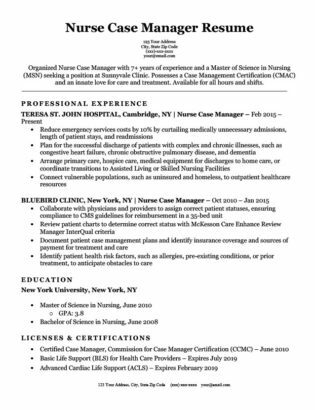 Skills: Tells the hiring manager the general type of nursing care the candidate learned during student clinical experience. Experience: Tells the hiring manager concrete examples of the types of care the candidate performed during the student clinical experience. Tools: Tells the hiring manager what types of tools they learned how to operate and use during the student clinical experience. Altogether, these three aspects of the candidate’s experience section gives the hiring manager a very clear picture of his or her skills or abilities, which is critical to landing an interview. If you’re still not sure about what skills you should list, check out our comprehensive guide that explores important hard & soft skills for your resume! Getting licensed, registered, and certified is a big part of successfully launching a career as a nurse. Certainly, it’s even more important for getting promoted, increasing your responsibilities, and increasing your salary. With those tips, you’ll be able to write a solid student nursing resume that lands you more interviews. Remember, you’re going to need a companion cover letter to really increase your chances of landing the interview.